"The TOC at first argued against the popular pick five, claiming it would not fly. Santa Anita wanted to institute it, but management was rebuffed. Finally, Hollywood Park was allowed to offer a pick five that carries an attractive 14 percent takeout, and the fans ate it up." Let's start with rescinding that terrible idea to raise the takeout at a time when fans were staying away from the game to begin with. It just gave them further reason to turn their backs on the sport. Sort of like a store with a $35 pair of jeans that's been sitting on the shelf for two years and raising the price to $44.50. Makes no sense at all. " After hearing reports from HANA members who attended yesterday's meeting, it seems little has changed in the way of the TOC thinking, when looked at from a customer (i.e. the people who pay for most of the purses) perspective. 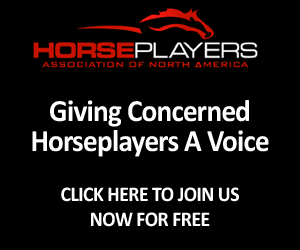 For more information, or to lend a hand and sign-up to the Players Boycott of California racing, please visit here. Bloodhorse's Tom LaMarra and Tracy Gantz today have taken what might be the most comprehensive look at the state of racing in California. 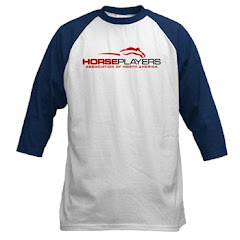 From the power groups to you, the horseplayer, all bases are covered. The article is a must-read for fans of the sport in that state, and beyond. “So many mistakes have been made by horsemen—ignoring the racetracks, horseplayers, and owners and acting on their own without getting the support of other constituencies,” Licht said. “Are they doing what they believe is in the best interests of racing, or are they acting in what they thought was in the best interests of racing? Proponents of the takeout increase used flawed revenue projections saying there was little or no elasticity between takeout and handle,” Platt said. “They argued handle would remain the same, enabling purses to increase dramatically, and that field size would go up as a result of the increased purses—in turn generating increased handle and revenue. Of course none of that happened. “HANA gave the legislature a more realistic argument. We told them the CHRB, TOC, and track management were using flawed revenue projections. We told them that racing’s customers see takeout as already too high, and that racing’s customer base would not support further takeout increases. We told them a takeout increase would cause handle to plummet, which in turn would have disastrous long-term consequences for track bottom lines and purses. There is much, much more at the link here. 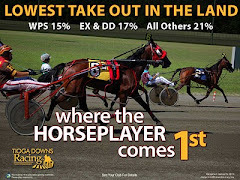 Without much publicity, Fort Erie has lowered the takeout on their Pick 4 wager (in Canada it is called a Win 4) This came into affect as of Sunday. Takeout was lowered from 26.2% to an industry tying low of 14%. In the past three days there has been a nice percentage increase in pool size. On Sunday, a total of $11,989 was wagered on both Pick 4's combined, up from $7,611 for the corresponding Sunday a year ago, representing an gain of 57%. On Monday the combined amount wagered was $15,629 compared to $10,582 the previous year, which works out to a 47% increase. On Tuesday with the combined total of $19,616 wagered versus just over $11,000 the Tuesday from the previous year, the Pick 4 pool size increased by 69%. Remember, this is with little fanfare, outside of a mention in the DRF which erroneously reported the takeout dropping from 16% instead of 26.2%. What is interesting is that it appears that the Horseplayer has started looking for, and playing low takeout type of wagers. On Sunday, there was a slight increase in total handle at Fort Erie (by 7%), but on Monday total handle was down 47%. And on Tuesday total handle was off by 27%. Last year they had an early post time Mondays and Tuesdays, this year the post time was 4 PM, and there was one less race this year. Other takeouts at Fort Erie are on the very high side, especially doubles and exactors (at 26.2%). Perhaps a 2:30 or 3:00 PM post time might make more sense, but it is pretty clear that the takeouts on doubles and exactors need to come down so that total handle numbers can begin to go on an upswing as well. Free Platinum PP's , Ray's Picks and much more for today's Harness Pool Party at Tioga Downs. With every thoroughbred player getting primed for the Belmont card Saturday, the HANA harness team has been working on this Sunday's Pick 6 Pool Party at Tioga Downs. We are pretty impressed with what the team- working with this player friendly racetrack- has achieved for his Pool Party, in a short period of time. These will be up tomorrow. Special thanks goes to Trackmaster and the USTA. 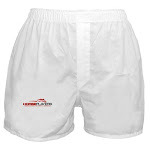 America’s ADW (http://www.americasadw.com) is offers a bonus for new customers who use ‘HANA’ as a promo code. Existing customers must write them for their special bonus. Compubet (http://www.compubet.com ) is offering a bonus for all members wagering on Tioga Downs card on Sunday. Big M Club card members receive bonus points for any wagers on Tioga Downs’ card on Sunday when wagered through simulcasting at the Meadowlands. 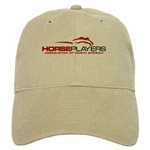 Horseplayersbet.com (https://bet.horseplayersbet.com) offers a bonus for wagering on Tioga. Mutuels Online (https://www.mutuelsonline.com) is offering rewards on the entire day’s card. Twinspires (http://www.twinspires.com) will be promoting the event and may be offering some prizes. .
Tioga has also produced a commercial for the venture, which highlights not only the pool party, but their industry low takeout. If you are a HANA Harness member, please consider playing a few bucks in this Sunday's guaranteed Tioga Pick 6!!! I suggest a cheaper, more common-sense approach to increase wagering: Just lower the takeout. A lower takeout would instantly make the product more attractive in the simulcast market. For a primer on the work being done (or lobbying on behalf of you, the long overburdened player) from Jeff Platt, HANA President, please review his blog post here. On the good news front, you have said time and time again that you want to support the racetracks who want to earn your business. One such track has caught the eye of our members who play harness racing - Tioga Downs. They were the only major track in North America - thoroughbred or standardbred - to lower takeout across the board this decade. Our friends at HANA Harness have started to arrange a Pool Party with Tioga for June 12th, which is coincidentally a marvelous betting card with myriad stakes. 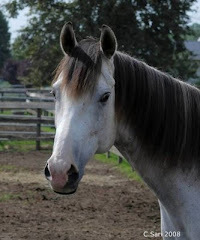 Please watch the blog for news, past performances (Platinum ones graciously donated by the USTA and Trackmaster) and much more. If you'd like to join the harness team and work with tracks like Tioga, please email Allan@hanaweb.org and he will add you to the mailing list and steering committee. Lastly, we are extremely close to releasing the track ratings for 2011. This player resource will allow players to quickly scan all the thoroughbred tracks in NA, with updated takeout rates, bet types, field sizes and handle/pool sizes. Thanks to all HANA members who helped compile this list.